Our Herbal Pharmacy is one of the largest and most complete herbal pharmacies in Wisconsin to provide you with individualized herbal formulae for all your health care needs. The pharmacy includes raw herbal formulas, capsules, high quality herbal extract granules, liquid liniments and powdered tablets tailored to each individual treatment plan. 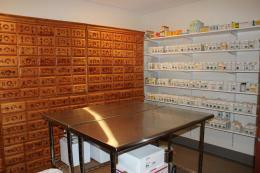 The pharmacy has an inventory of over 450 different herbs both in raw form and pre-made formulas. As your health invigorates and you become well, your herbal prescriptions can be individually adjusted to your improving health conditions. For detailed information or any questions, please contact us at (414) 727-4640.